In the Russian language there’s a saying that fresh air, sun and water are the best friends to every human being. Belarus as an inbound county cannot boast of sandy beaches or extremely hot summer seasons but it can definitely take pride in its numerous lakes and rivers for which it is called the blue eyed one. Unfortunately, swimming in Belarus is not possible throughout the year as moderate climate can’t guarantee that you won’t get a cold afterwards. Despite the climate being not favourable enough to have a swim outdoors there are no obstacles for enjoying water in any of the swimming pools in Belarus. The capital is the leader in the number of swimming pools and their availability. 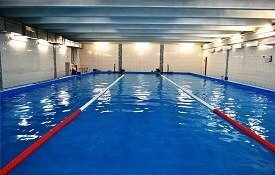 Swimming pools in Minsk comprise a large 25 or 50 meters long pool with 5-8 lanes each and various additional recreation equipment and services such as saunas or jacuzzi. 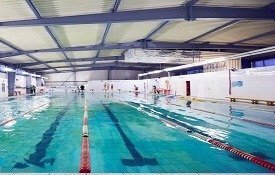 Numerous training centers are open to the public so you can swim in the same very pool some Belarusian Olympic champions once practiced in. 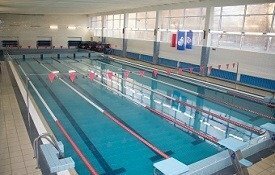 Swimming in Minsk is popular by people of different ages with many pools opened at schools. The hygiene is the major caution of the swimming pools runners that’s why you won’t be allowed in without a proper bathing suit, swimming hat and rubber sandals. 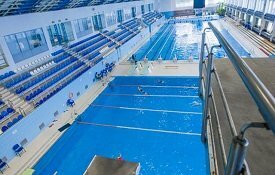 Swimming pools in Minsk stay open during the day with only a few of them welcoming visitors at night. For night swimming lovers who enjoy loud music and parties combined with extreme activities such as water slopes riding the best option would be to visit Minsk waterpark “Lebyazhy”. 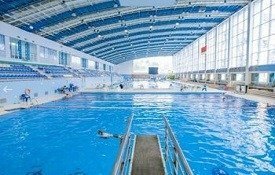 On this page you can see a list of best swimming pools in Minsk which can help you decide where to enjoy the relieving and washing away stress swim. We also draw your attention that swimming pools have days-off and the days of special sanitarium cleaning on which they are closed. Please, mind the requirements of the swimming pool as they may differ from one pool to another one.